Complex challenges are prevalent in the workplace, making it difficult to find one glove that can protect you against most hazards. The Uvex Protector Chemical-Resistant Safety Gloves NK2725B can easily overcome even the most complex challenges. Crafted with a multi-layered structure, the gloves provide reliable cut protection while guarding you against chemical and mechanical hazards. The product code for these gloves is 60535. The Uvex Chemical-Resistant Gloves NK2725B have been tested to EN 388, the European standard for gauging how effectively a glove protects your hands against mechanical risks. Please check the table below to find out the results for these gloves. 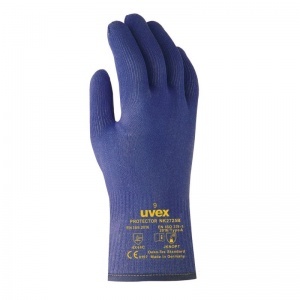 The Uvex Protector Chemical-Resistant Safety Gloves are available in two different sizes. Please measure the circumference of your hand around the knuckles (excluding the thumb) with your hand open and your fingers together, then refer to the table below to find out which size will fit your hands best. These gloves are approximately 27cm in length for improved forearm safety. Learn more about the cut resistance testing used for these gloves by Uvex. Each glove is tested to ensure it's in compliance with the EN 388 standard for mechanical safety. These gloves offer cut level five protection for your safety!